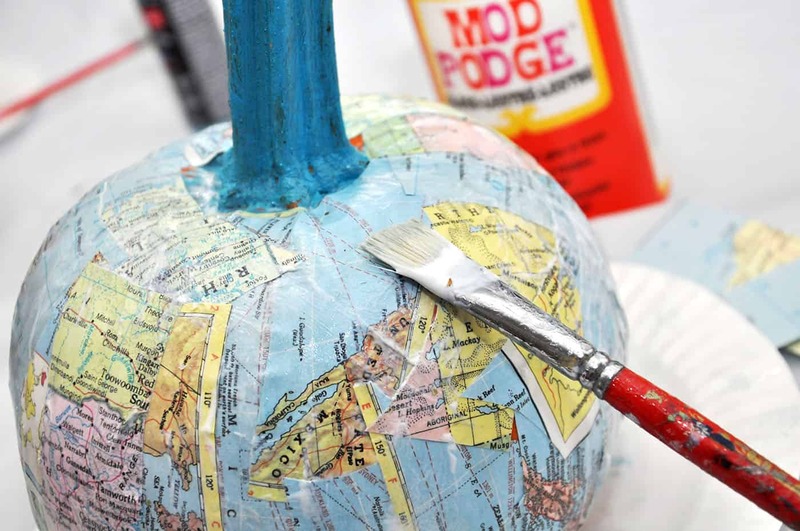 Try a seasonal craft that is a bit different with these unique Mod Podge pumpkins! 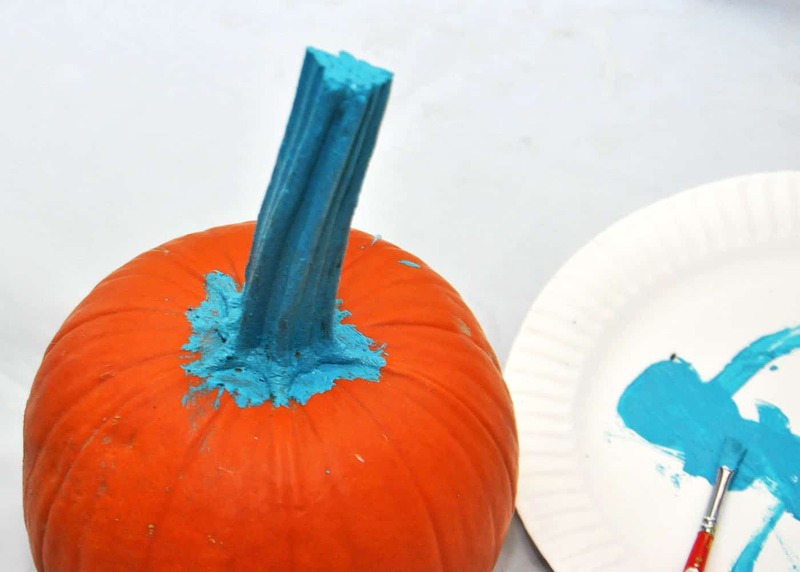 These DIY pumpkins are SO easy to make. 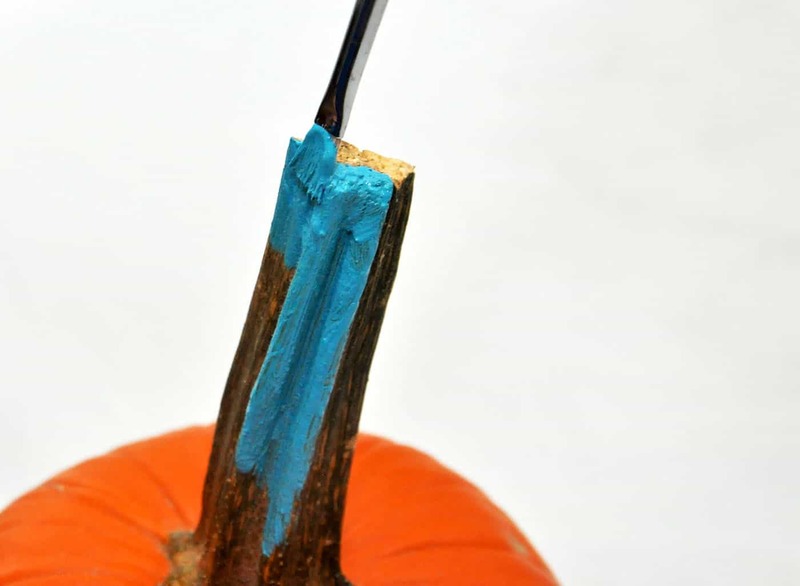 There are so many creative ways out there to decorate pumpkins, and I'm going to show you one of my favorites that is no-carve. 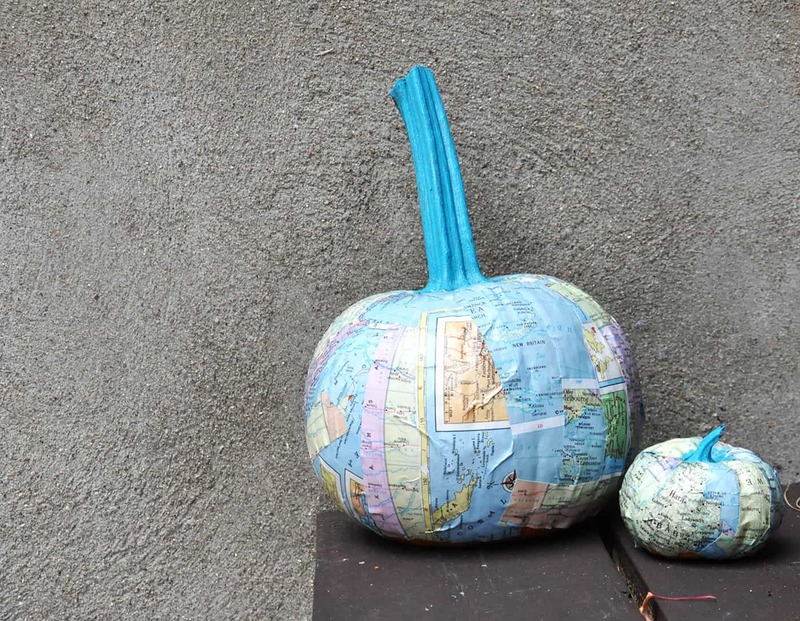 I've shared painted pumpkins before, so you're familiar with that – but have you ever covered a pumpkin in maps? 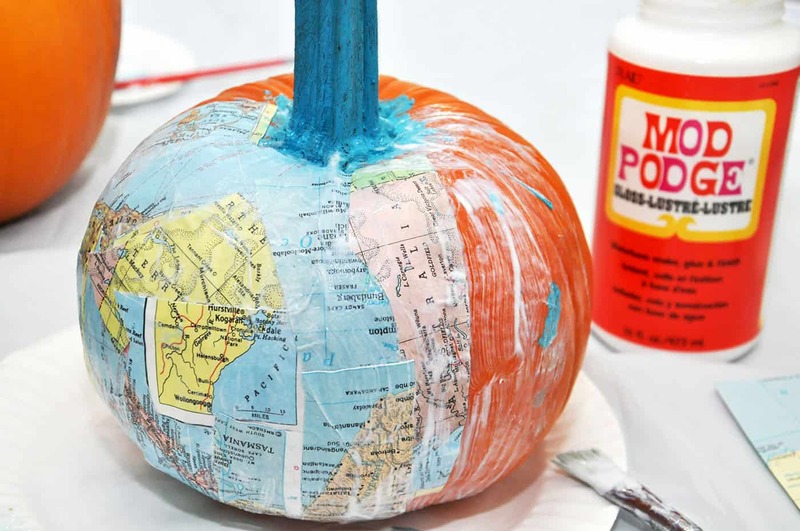 This map wrapped pumpkin is fun and easy to put together. Plus it's an amazing addition to any fall decor. 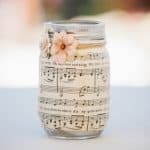 Before we dive into this project, I wanted to address a few commonly asked questions/issues you might have about how to make this cute fall craft. I hope these help you in your pumpkin decorating journey! 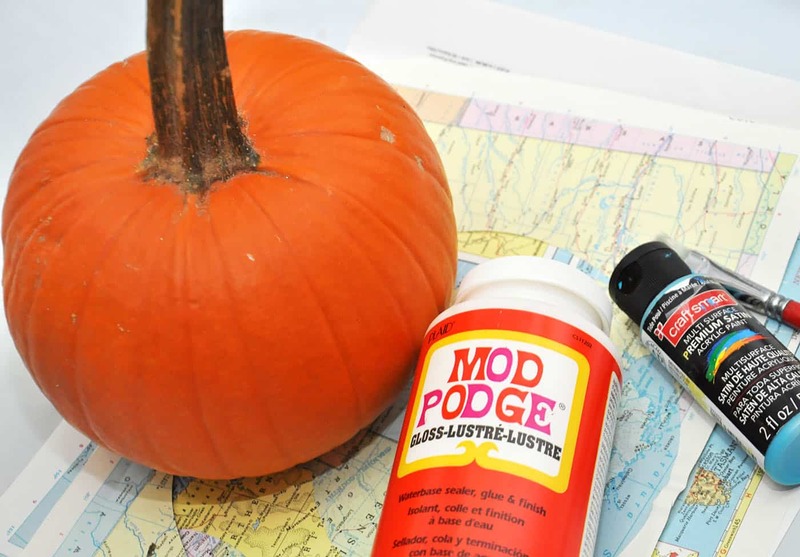 Should you use real or fake when making Mod Podge pumpkins? It's something that people are always wondering and good news . . . the answer is you can use both! It doesn't matter if you use a real pumpkin or a fake pumpkin. Either will work. The advantage of fake pumpkins is that they last for years. 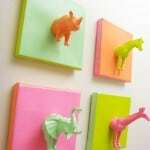 The best place I've found to get them is either AliExpress or Oriental Trading Company. Michaels has them too (use a coupon!). A real pumpkin can only be used for a season and will have to be tossed, though it will be cheaper. 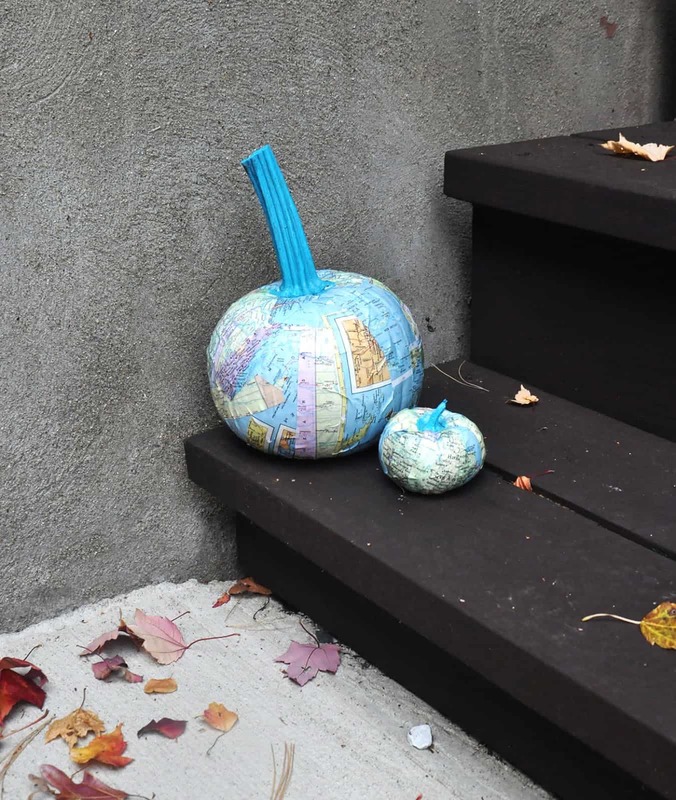 There's nothing that you need to do to the maps to get them ready for this DIY pumpkins project, aside from cutting them into either strips or small squares. If you decide to photocopy a map, use laserjet instead of inkjet to avoid ink smearing everywhere. If you apply the map to the pumpkin in strips, you're likely going to get wrinkles in the map. That's because of the round shape of the pumpkin vs. the flat paper. There are a few pieces of advice I have for you if this is frustrating. First, you can cut the map into smaller pieces and apply it that way. Second, you could cut darts in the paper (cut a “V” like you would in a sewing pattern) and overlap as you're Mod Podging. Third, you can simply love the wrinkles. 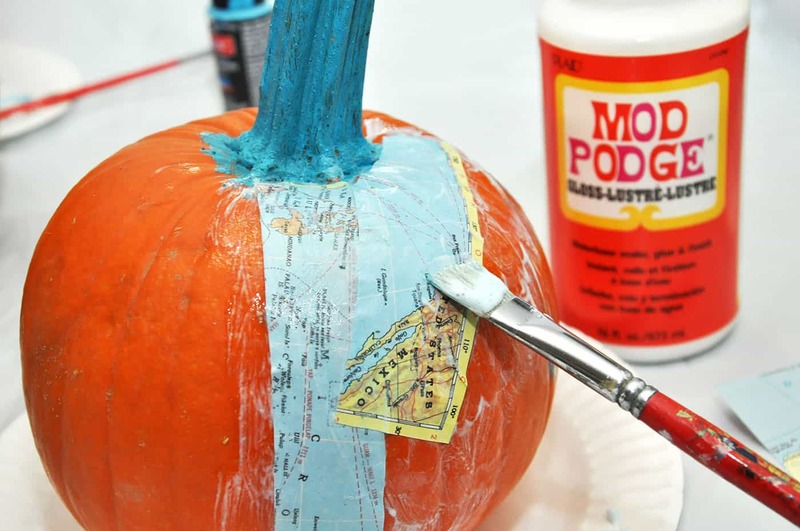 Are you ready to try these Mod Podge pumpkins? Keep reading! First, wipe down the pumpkin with a damp paper towel to make sure all the dirt is removed and let dry. Then paint the stem with your desired color and allow to dry. This usually takes anywhere between 30 minutes to an hour. Cut the map into random strips. 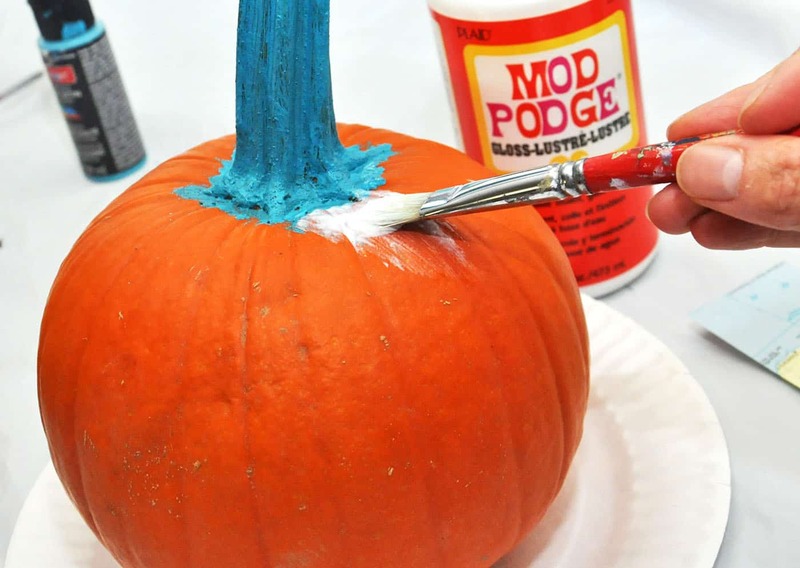 Brush a medium layer of Mod Podge down onto the pumpkin. Lay down the map strips and allow to dry for a few minutes. 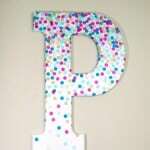 Brush a thick layer of Mod Podge on top of the strips. 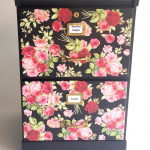 Continue to overlap the map strips and secure with Mod Podge. Press the strips down with your fingertip. Allow the entire pumpkin to dry to the touch and then add another layer of Mod Podge over the top to secure the pages completely. I love how modern and cool my map pumpkin looks! 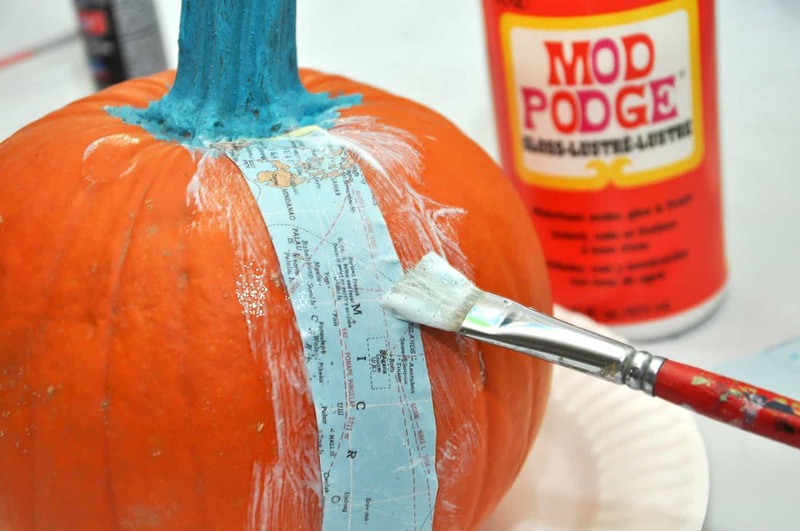 Tip: if you'd like to display this pumpkin outside during the fall months, use Outdoor Mod Podge. 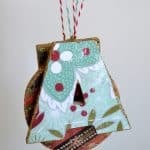 You don't necessary have to use Outdoor Mod Podge if this is under a covered porch or in an area exposed to the elements. 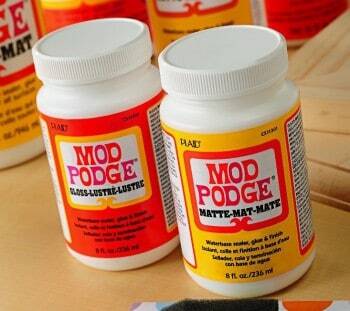 Gloss or Matte Mod Podge will work just fine!